As a homeschooler, what I believe about real education contradicted by the pressure of doing what most people think school should look like, haunts me day and night. There are a few, desperately pleading education reformers out there saying the most logical things human ears have heard, but are largely ignored because, “the status quo.” We must do what others are doing, no matter what logic we are confronted with. Because if we don’t, we must face our greatest bully: FEAR. I’d love to have a conversation, here, in the comments, about this journey of homeschooling in light of the following ideas. The idea that schooling isn’t really education and why do we force children to learn things that will have little to no bearing in their adult years, that will rob them of learning more valuable skills, that robs them of pursuing passions and interests leading to meaningful careers and accomplishments. Let’s consider the idea that yes, people can and do learn what they need to when they need to. And really, that’s the only time any of us ever really learn anything. Can we talk about the sorely lacking life skills among our young adults which costs them money which means their salaries are reduced by being forced to hire other people to solve their problems? This is how I feel and what I long to be able to embrace, free from fear, in our home one day soon. “High schools have failed. They are all about college prep but they shouldn’t be. It is not the role of the high school system to make admissions decisions easier for colleges. Now, colleges dictate the high school curriculum by “suggesting” that students take certain subjects before they apply. The colleges need to be encouraged to ask for examples of thinking ability, communication ability, and being able to get along with others. Then, the colleges themselves can teach whatever they think their new admits need to know…. So what should you go to school for? This is really an easy question to answer. First ask yourself what you really like to do in life, what you think about on a regular basis, whom you admire, and whom you wish to be? Only you can answer those questions. When you come up with answers, ask if there are jobs in that area. Be creative. Make up a job if you don’t think one exists. Ask what you need to learn to do in order to become a person who thinks about or does all day whatever it is you like to think about and do all day. Extrapolate up. If you like working on your car, maybe you would like working on airplanes or ships for example. If you like hanging out and talking, ask yourself who gets paid to do that (salesmen?). Find out where those who do what seems to be fun learned to do it. Often the answer is “on the job.” If that is the answer ask yourself how you can get a low level job in that area and work your way up. People learn by doing. Ask how you can start doing. “How do we choose who studies the elite subjects? We don’t. I always said what difference does it make who was king/queen back in 1800. Kids have to memorize things that have nothing to do with their life. Have you heard of the Funschooling Journals by Sarah Janisse Brown? I only have a second, but you should google it if not. 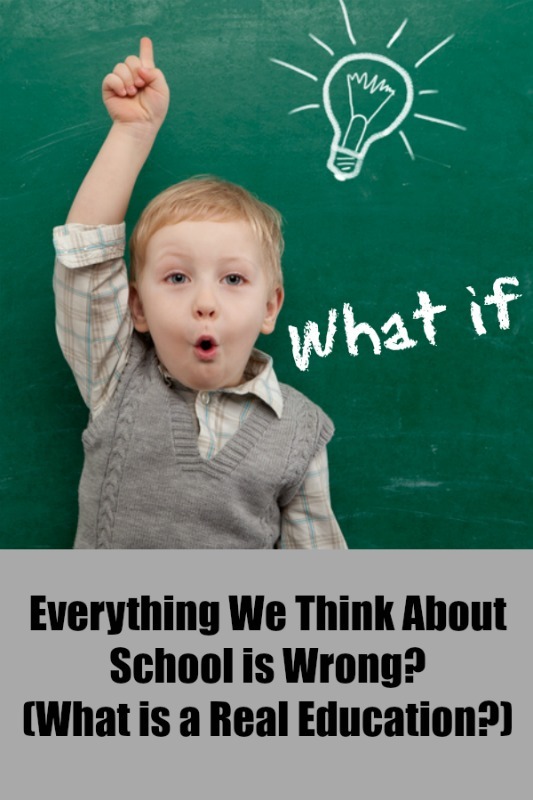 Or look up the facebook group “Funschooling with The Thinking Tree. After 4 years of homeschooling, I’m finally learning to let go of the traditional school philosophy I grew up under. But, like you, it is so hard to do, and something I have to constantly revisit in my mind, as I’m surrounded by so many that feel like the modern education system is the only right answer (or even an answer at all). Looking forward to coming back and reading more comments. Thanks, Kate, no I haven’t. I’ll have to check it out. Ok. This is my favorite. Yes!!! Thank you for writing this post Kelly. I was blessed to start out our homeschooling journey with great mentors and wonderful books. When our oldest son graduated and decided to join the Navy, he scored very well on his tests. Ironically, even after this fact I was hounded to produce evidence of his “education”. I believe education is so much more than academics and I am so thankful to be able to provide this to my children! You might find some creative ideas for reporting from some unschooling websites. Excellent article. I love homeschooling and the freedom it provides. We do a Charlotte Mason approach to school work. For history we choose to read books about the time period and even biographies/autobiographies about the subjects we study and then we discuss them. My kids are absorbing more than I did when I went I public school! We unschooled and this is something I try to tell every homeschooler! We don’t have to do “school” at home! We can do whatever we want to! I taught my kids to love to learn and how to learn. We did stuff outside, asked lots of questions, read books out loud, did life together, played games together, etc. I gave them responsibilities and made them be responsible for things they wanted to learn or do. I didn’t pick up the slack when they failed. And they learned LOTS! A really good website we used is called everythinghomeschooling.com a huge jumping off point to lots of discussions and fun times together! Have fun with your kids! Learn who they are! Learn who you are! Helping kids realize they can and should be responsible for themselves is huge. I’m pretty sure our brilliant forefathers were raised with more of this mentality. I want my kids to know that their brains, their curiosities, their ability to learn–it’s all a gift to be used and stewarded, and they bear much of the responsibility for using it or wasting it. The most meaningful thing we can do for them is NOT to make them think they can only learn from someone who is feeding them information, but rather the world is theirs to learn when, how and as much as they’d like. At least I think I’m right about the way I’m seeing this. Anyone else is free to offer a different opinion. I love this, Kelly! My oldest kids (23 and 25) had to suffer through our learning that homeschool did not have to be like public school. After over 18 years, we will be changing cover groups this year. Many cover groups are falling into the same type trap as public schools, as far as what they are requiring. I have found that with our 6 from China, I have a hard time filling out the quarterly reports, and making them “look good”. These kids are special needs, and started life in another country! We don’t need to be checking boxes and filling in bubbles, they just need to learn how to live life! I certainly want them to live up to their full potential, but that’s not for a check sheet to decide. We have high standards, and are not lazy, we just think there are so many more interesting things to learn that what is in a traditional textbook. Yes, Janet. I talk to so many whose cover schools make it so difficult. I agree so much with you. I also want to add, we live near a mennonite community. As a rule, they school to or through middle school. Then the students work in internship type situations, learning trades from other mennonites. Not only are they fully trained by adulthood (for most things), but they have also been learning responsability, managing their earnings, etc. I think they have stuck with the old way because it works; why have most school systems tried to re-invent the wheel? We homeschooled our children from 5th grade through 8th grade and one through 11th, we only had them read a couple of hours and then do an hour of math. They were very well prepared for private Christian high school. They read historical fiction, missionary biographies, and good, interesting books that developed a love for reading. Afterward doing “school,” they played sports, did all the yard work, surfed, etc. Both of my sons have grown up to have great careers that provide well for their families. I went through public schooling my entire childhood and then a Christian college. I disliked most of my classes and use barely any of what I learned in my daily life. I agree with you 100%. I **LOVE** this. The more I heard from people like you, the more I’m seeing that what Schank is saying is true: given basic skills, kids can pick up when it’s time, and learn what they need to learn to head toward their given field. I wish more parents understood that. So, I get what is being said, but I think it’s still possible to provide a vibrant childhood and still require some hours of basic book work each day or week. Also, this mindset is so different, that it seems like many of us who were public schooled would have hard times figuring this out… unless you have the right context to do it. What i mean is, a dairy farmer, who works at home, and has several children plus wife, has an automatic context by which to include his children in the larger world and work. There are practical things each child can learn to help the farm. Also, a farm has lots of space, and room for children to explore, question, experiment etc. I know, living in a small town with five kids in a normal 3 bedroom house with all the kids in one room is getting cramped… And our imaginations are cramped too, b/c there is no real way to do anything bigger. There is no way to do a business here very practically b/c we have so little room for any inventory. I am doing a tiny etsy shop trying to sell upcycled yarn (wools and wool blends) and just that is a struggle to figure out an efficient way to store it, work on it, organize it etc. It’s in our living room with my desk and sewing machine and it’s a constant struggle to keep it orderly. We have a dream of buying a place (a junk heap if necessary) on 5 or 10 acres and putting in a u-pick blueberry patch, and develop a small homestead and do small scale agriculture as a family(probably with the hubs still having to work for a LONG time). We have our house for sale, but we’ve had few hits and I’m getting almost frantic and frustrated. I am trying to balance bookwork with hands on projects–we’ve made soap, built a toddler bed from wood scraps, learned to net a hammock, kept a garden and other things, but there is so little scope for imagination here,(i’m running out of ideas!!) for them to dream and they make suggestions about stuff and I look around at our little tiny house with no garage and scratch my head, and wonder, “how?” This house has been great for when the kids are little, but the thought of still being here when the oldest is 15 or 16, still at home with mama and the little ones just won’t work! How do you do this when you feel limited by circumstances? And in many ways are living paycheck to paycheck, with little to nothing to invest (and are already doing all the skimping/frugal stuff!!). Also, my hubs doesn’t have many skills himself, to teach or pass along to boys. He lets them help as he tries to work through household projects, but he’s figuring things out too, and isn’t working from a base of practical knowledge either. He also struggles to let go of the “school” model of education… sigh… theory seems so much more doable than reality. What about giving your children opportunities outside your home? Other people they can shadow, learn from, hang out with? Don’t underestimate conversation and things that don’t necessarily require space. Utilize the library as just a source for exploring different interests. Save up for a microscope. Visit a museum. Just exposure and asking questions and being open to what’s around you. I think there is so much value in that. Laura, I so understand where you are coming from. We have four children in a three bedroom townhouse. No personal property, with lots of rules from management about what we can and cannot place on our outdoor patios. The kids just want to make “soup” with the bushes and plants around here, but they are not allowed to because it’s not our property. We have no garage, no storage units – nothing really to be able to expand and offer our kids the ability to create more. Even space inside is very limited and we’re always purging!!! I understand that it’s hard to look around and watch other families be more creative and use their space to foster their kid’s hobbies. But I always remind myself that God has each of us exactly where we are for a purpose. It might not make sense, especially when we have all these unmet desires and hopes, but I have to trust that He will gift my kids in the ways He wants to. I catch myself saying no a lot to my kids (the fact that we just don’t have the space to set up or to store things), but we do take advantage of field trips and library books. The biggest thing is realizing that not all families are alike or have the same set up and we can do the best with what we do have. It’s not an easy lesson, but it’s all part of God moulding us and changing our heart’s response. The other thing that came to mind for me about the limitations of the classroom versus home education is the opportunity to substantially address character issues in the children. I was reminded of that when my adult son called today and related an experience he had last night with law enforcement officers who went to the wrong apartment building and thought my son was the man who had allegedly pointed a gun at someone else. Pat-down, apartment search, questioning during the search, the works, but short of handcuffing and hauling him in. An experience that shook him up, but one in which, thankfully, he remained calm and respectful, not angry or sassy at their mistake. I don’t say that to boast, “Look what a great son we raised,” but to say that he did have anger and sassing issues as a child, but God in His mercy used the lessons we attempted to teach our son about his character for good. It doesn’t always happen that way (children certainly are capable of and sometimes do reject their training in righteousness, and when they don’t, all the glory goes to God), but we parents still have a responsibility to train them up in the way they should go, and it is very hard to do that when they spend so many hours per day, days per week, weeks per year, and years of their childhood away from home for their schooling. So, really, what I’m trying to say with all this is that acquiring and hanging onto good character is an important life skill, and teachers in school systems are hard pressed to provide that. When I taught school many years ago, there was a period of the day that was set aside for “SSR” — Sustained Silent Reading. (Or referred to by the teachers — privately — as Sit down, Shut up and Read.) Crowd control isn’t the same as character training, and teachers can do very little to instill good character in the face of all that foolishness from massive numbers of kids who don’t care. And it’s not hard to see why they don’t care, when there’s so much time wasted on irrelevant matters for their current, and often future, lives. A bad situation all around that is getting worse, a friend of mine who is still teaching reports. Good thoughts from Schank. Yours too, Kelly. Thanks for sharing. I have three boys that have graduated from our homeschool, six more still at home. The boys are all well employed, their bosses love them because they know how to work. We live on a ranch and our homeschool is heavy on vocational agriculture. Lots of time helping dad! The boys have different interests and skills, none are in ranching right now. Our pediatrician is always asking what grade my kids are in. I have no idea because I’m not trying to replicate the public school. If I was, it would be much easier to just send them on the bus. All that to say, we can relax and enjoy their educational journey with them.